In today’s News & Notes, Alex Galchenyuk is set to make his season debut tonight, The Vancouver Canucks will be without one of their top young players for few days and Alex Radulov is dealing with a minor injury of his own. The Arizona Coyotes will get their first official look at Galchenyuk in their team’s uniform Tuesday as the 24-year-old is set to make his 2018-19 season debut against the Columbus Blue Jackets. Galchenyuk was acquired by the Coyotes from the Montreal Canadiens during the offseason in a deal that saw Max Domi going the other way. LAS VEGAS, NV – SEPTEMBER 16: Alex Galchenyuk #17 of the Arizona Coyotes skates during the second period against the Vegas Golden Knights during a preseason game at T-Mobile Arena on September 16, 2018, in Las Vegas, Nevada. In 418 games, Galchenyuk has scored 108 goals and 255 points and has been a dynamic offensive weapon. While he hasn’t yet panned out to be the player the Canadiens were expecting when they took him third overall in 2012, he has proven he can be an NHL player and has a 20-goal season and a 30-goal season under his belt already. With a fresh start in Arizona, Galchenyuk will get a chance to prove that he’s able to consistently produce at the NHL level. 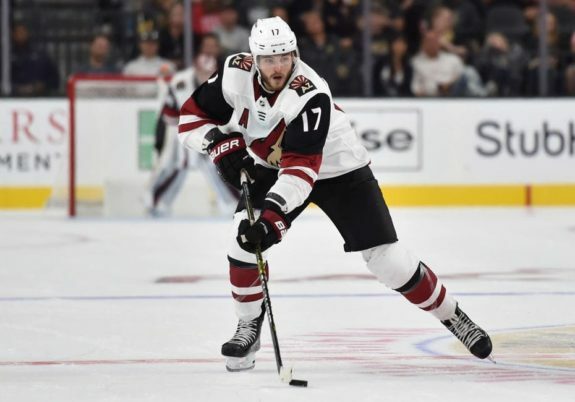 Whether or not he gets consistent ice time at the center ice position or not is yet to be seen but the Coyotes seem keen on using him in that role early on. In his first game, Galchenyuk is expected to center the team’s top line which features Clayton Keller and Lawson Crouse on the wings. Brock Boeser will be out of action with an injury and was absent from the Canucks practice Tuesday morning. According to Patrick Johnston, the Canucks deem Boeser day-to-day with a lower-body injury. The 21-year-old Boeser was one of the favorites to win the Calder Trophy last season as one of the league’s best rookies. 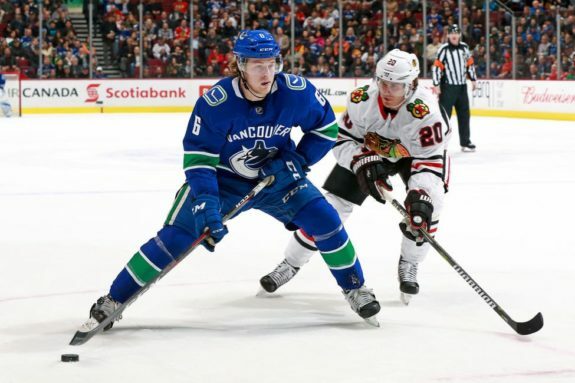 In only 62 games with the Canucks, Boeser scored a very impressive 29 goals and 55 points and showed that he should be considered one of the best right wingers, not only among rookies but among the entire league. This season, Boeser has scored two goals and six points in nine games and though he hasn’t been able to find the next with the same consistency early this season as he did last year, there should be no concerns with him lighting up the lamp as the season progresses once he returns from this seemingly minor ailment. As Mark Stepneski is reporting, the Dallas Stars will be without Radulov in their game against the Los Angeles Kings on Tuesday. 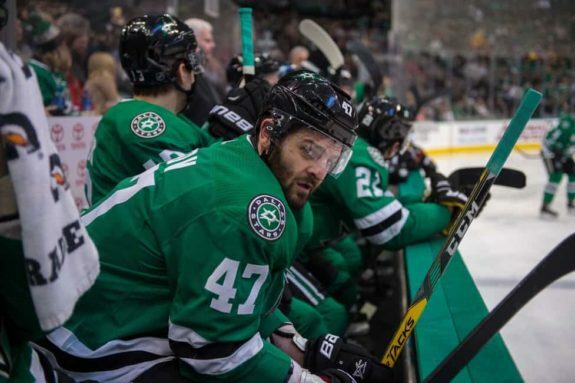 Radulov has served as the Stars’ right wing on their top line alongside Tyler Seguin and Jamie Benn since joining the team in free agency a year ago and has performed admirably in the role. In 82 games last season, Radulov scored 27 goals and 72 points and was able to produce at a level above what he’s ever done in the NHL at the past but was similar to what he’s shown he’s capable of during his time in the KHL. This season, the 32-year-old has scored four goals and 10 points in six games and assuming the injury he’s dealing with right now is minor, he’s in good shape to have another breakout campaign. The Stars are expecting Tyler Pitlick to fill in for Radulov on the top line in Radulov’s place Tuesday night.